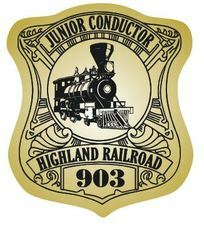 Custom printed railroad junior conductor or junior engineer badge stickers on a roll. Kids love stickers, watch the smile on their face when they're handed one of your railroad junior conductor or engineer badge sticker to wear. Promote your railroad with these customized stickers with your railroad logo and name, they are great to hand out to children at railroad events throughout the year. We use your wording, logo or select from one of our stick logos below to create your custom design. These sticker are an affordable way to promote your train events. Prices below include one color of imprint​.